Planar scintigraphy using Tc-99m pertechnetate is useful for snapshot evaluation of hot thyroid nodules, which are pathologically follicular adenoma and seldom, if ever, malignant. The autonomy of the hot nodules has been demonstrated by the presence of thyroid-stimulating hormone-dependent extra-nodular thyroid tissue besides the hot nodules. 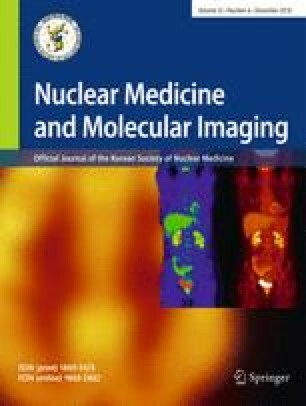 Here, we present two cases of hot thyroid nodules in patients who underwent quantitative single-photon emission computed tomography/computed tomography (SPECT/CT). In addition to the nodules, contralateral normal thyroid parenchyma was evaluated based on standardized uptake values. One patient had a traditional follicular adenoma suppressing other thyroid tissue, whereas the other patient seemed to have a nodule erupting from underlying hyperfunctioning, not suppressed, thyroid tissue. This novel approach using quantitative SPECT/CT unveils a new pathology of hot thyroid nodule that does not suppress, but coincides with hyperfunctioning thyroid tissue. This work was supported by the Basic Science Research Program through the National Research Foundation of Korea (NRF) funded by the Ministry of Education (2018R1D1A1A09081961). Reeree Lee, Young So, Yoo Sung Song, and Won Woo Lee declare that there is no conflict of interest. The study was approved by an institutional review board (IRB) and was performed in accordance with the ethical standards set in the 1964 Declaration of Helsinki and its later amendments. The need for patients’ informed consent was waived by the IRB.